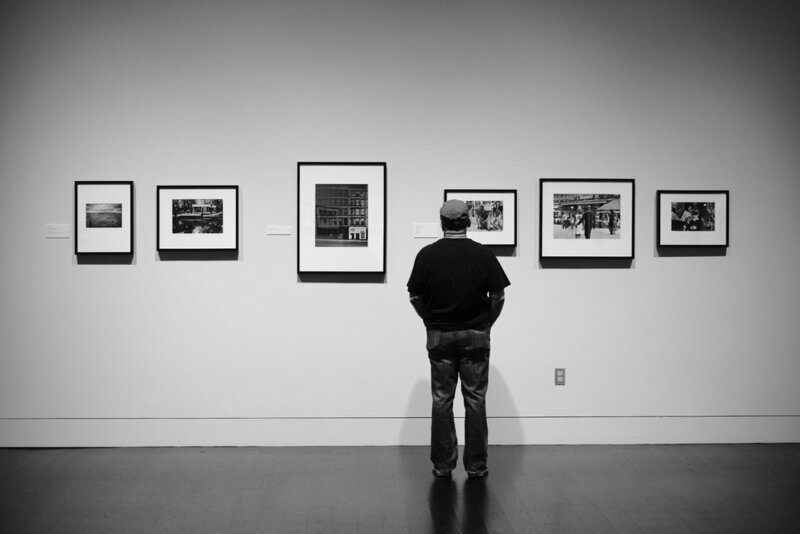 The Harry Ransom Center on the UT Campus is currently exhibiting a collection of Elliot Erwitt's prints. I had some time to stop by this afternoon. What a treat! I own a couple of his books and having now seen these silver gelatin prints, the pages of the books don't do his work justice. My stay at the museum was limited to about an hour. That wasn't enough time. Those beautifully printed images made me pause and look deeply. I'll be visiting again before the exhibit concludes at the end of the year. Mr. Erwitt has a unique way of looking at the world. A lot of his images reveal his sense of humor. His keen eye catches interesting bits of detail in the mundane. One can learn a great deal about composition and timing from studying his images. In much of his work Erwitt manages to impose a bit of himself - commenting on a person, thing, or situation without saying a word. There was a quote displayed among Erwitt's famous collection of dog photos that caught my attention and appropriately sums up his approach to the subject. A.D. Coleman wrote, "Erwitt sees dogs - and thus, inferentially, people - as sad and funny creatures, at the mercy of forces beyond their control, subject to indignities inflicted more inadvertently than deliberately by a power structure which dwarfs them, yet able to survive, nourishing their bodies and spirits, giving and receiving."